Similar to WhatsApp and Viber, LINE is a popular app that offers free VoIP calls and instant messaging. Serving more than 200 million users worldwide, Line is used very often to connect with friends and family. Do you use Line app for messaging and want that information to be secure and safe? In this tutorial, we will walk you through the entire step-by-step process to backup and restore Line chat history on iPhone XS/XS Max/XR, iPhone X, iPhone 8/7/6s/6 Plus or iPad. 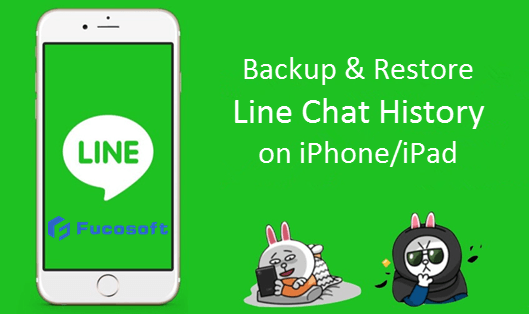 To get started with Line chat history backup and restore, please download Fucosoft iOS Data Backup & Restore and get it installed on your computer. This tool offers an easy way to backup your line chats on iPhone XS, iPhone XS Max, iPhone XR, iPhone X, iPhone 8/7/6s/6 Plus or iPad and restore it to your device as you want. The program works well on all iOS versions including the latest iOS 12. Run the Fucosoft iPhone Backup & Restore tool and select “Acquire Backup from Device & iCloud”. then click on “Back Up Device”. Connect your iPhone/iPad with USB cable. Once your device is detected successfully, click “Make a Full Backup” and select the folder you wish to save the backup file. After that, you can click on “Back Up” to begin the backup process. When it is completed, you can see your Line chats and other data in the backup file. Run the program and click on “Restore Backup to Device”. The software will list all your backups on this computer, just choose the full backup you’ve made and click “Next”. Click on “Restore Full Backup” and use an USB cable to connect your iPhone to the computer, then select “Preview & Restore” to continue. Now you can preview the Line messages as well as other data in the backup file. Click on “Restore” then choose “Merger & Replace” to restore Line chat history to your iPhone. Of course, you can perform a manual backup of Line chats on iCloud, and restore Line chat history from the iCloud backup. However, Fucosoft iOS Data Backup & Restore can do more than that. It enables you to backup and retrieve other iOS data like WhatsApp, Viber, Kik, Facebook Messenger, photos, contacts, text messages, notes, calendars, Safari bookmars, voice memos and etc. If you haven’t make a backup, we suggest you try Fucosoft iPhone Data Recovery which can help you retrieve deleted Line chat history on iPhone directly.